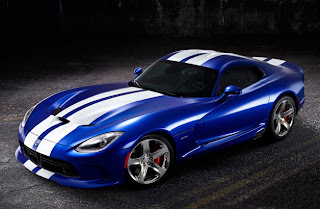 The Viper GTS line of cars has always been Dodge's high-end, European-style sports cars. Representing the high-end of GM's market, they have been a hit at auto shows all over the world, and are exceedingly popular among speed enthusiasts. With a V10 engine, lightweight construction and incredible amounts of horsepower, it can outrun and out corner almost any other street legal vehicle on the market. It also costs much less than its Japanese or German counterparts, making it an attractive option for street and weekend racers. The 2013 Viper is, unlike the two previous generations of Viper, a completely new design. Rather than updating older frames and layouts, the decision was made to develop an entirely new engine, body and frame. This maximizes speed and performance and enabled Dodge to throw out many of the limitations and compromises inherent in previous Viper designs. It thus has power, features and handling unlike any other Viper. It is also larger, longer and heavier, with a unique design and layout. Unlike almost any other modern car, the 2013 Viper GTS has an enormous hood, with the cabin of the car pushed into the rear third of the vehicle. This has been done to make room for the enormous 640 hp V10 engine, which is among the most powerful ever to have been placed in an American sports car. In fact, it produces more torque than any other naturally aspirated street legal car. This enables the 2013 Viper GTS to travel at almost 200mph in a straight line. It also has superb acceleration, going from 0 to 60 in under five seconds. This enables it to compete with many Italian super cars in terms of speed and acceleration.